Tokyo Ghoul:re Season 2 Premier Details and News – The Season 2 Will Hit The Screens In Oct.
Tokyo Ghoul:re season 2 is gearing up for a release on Oct. 2018 and the excitement is ever increasing. The official website has confirmed that the Tokyo Ghoul is getting a second season and the trailer has given us some serious glimpses of what is about to come in the upcoming season. The television anime of Sui Ishida’s Tokyo Ghoul:re manga has revealed a new visual for the anime’s upcoming second season on Thursday and now fans are eagerly waiting for the release of the season. The 2nd season of the anime series will release in October and the first eight episodes of the 2nd season will be in English dub version/format. The first season had 12 episodes and it was aired in April. Funimation is streaming the series with the English subtitles and after the first eight episodes, there will be a delay of two weeks before the ninth episode comes out. There will be overall 24 episodes and its episodes will split up into two halves. The latest season of the series has given a hint of the ending as the Tokyo Ghoul team is preparing for an end. Furthermore, we might see some serious revelation in the upcoming season. 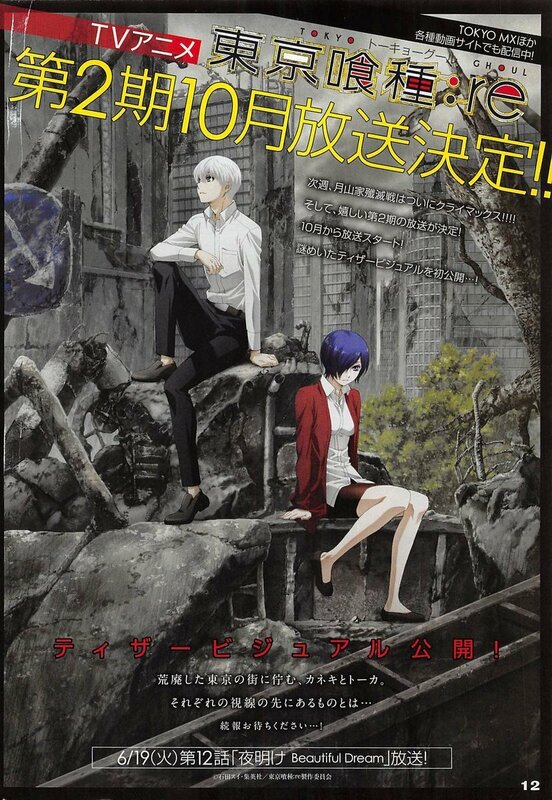 The news broke out in volume 28 of Weekly Young Jump and a key visual was also released which had Kaneki Ken and Kirishima Touka sitting amid the devastation of an abandoned cityscape. For those who are unfamiliar with the series, Sui Ishida is the creator for the original Tokyo Ghoul series. The plot of the story revolves around Ken Kaneki, who almost died on a date. He is a ghoul who is a half human and eats humans, and these ghouls have been living among humans secretly. Kaneki needs to have human flesh in order to survive and live normally. He also joins a group of ghouls at the café Anteiku. The sequel of the Tokyo Ghoul has been going great so far and everyone is enjoying the story as well. So, it will be interesting to see how the season 2 of this series will turn out. We would like to know your views on it as well. Let us know in the comment section now.